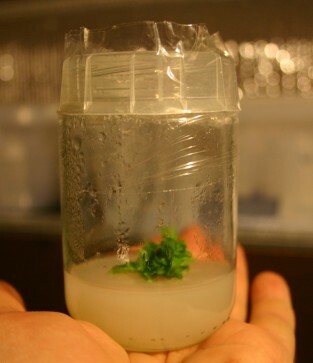 I’ve pretty much wrung-out the possibilities of propagating by grafting, and wanted to delve into some other hard-to-propagate fruits, and so I’ve ventured into the rarefied air of plant tissue culture. Tissue Culture is growing embryonic plants from parts of the tree you wouldn’t always think of for starting plants, like slices of the leaf. The sterile growing medium this cherry is in consists of tapioca starch, coconut milk, table sugar, minerals, vitamins, growth hormones, and a preservative. This clump will multiply and be divided into more jars, and continue to multiply until its time to change the hormone so it will grow roots. Photosynthesis is not necessary, as it bypasses the usual method of making food, where chlorophyll takes sunlight and water to make glucose. The plant takes up sugar directly from the medium and actually grows better in the dark. Gardening in a baby food jar with no bugs, no disease, no sunlight, and the end result is clean, vigorous plants; there’s a lot to like about this.